A lot has been written about Fabric in the last couple of months, especially in wake of its licence being revoked by the police and its subsequent closure. A lot of ground has been covered about the reasons why Fabric was shut down and the wider implications for dance music venues in the capital and beyond. At present there is a large internet campaign to raise funds for staffing costs and legal fees which at the time of writing had exceeded £130,000. Whilst other clubs have shown their unity in recent days by turning their music off at midnight for one minute as part of a silent protest. The campaign is hoping to raise £500k to cover potential bills and at present the donations are coming in thick and fast. The money and the unity shown by fellow venues shows two things, firstly the cultural significance of Fabric and secondly that this is just part of a worrying trend of club closures. It feels that at some point in time a line in the sand has to be drawn, that feels about now. If we have learned one thing in recent weeks, it is that Fabric transcends club culture. Articles have not only appeared in Mixmag, Resident Advisor and FACT, but also in the national media including The Huffington Post and even the academic led The Conversation. The last time dance music achieved this level of media publicity was back in 1994 and the Criminal Justice and Public Order Act or prior to that with the mass media acid house rave panic. The support for the club has gained momentum with such as the Mayor of London Sadiq Khan criticizing the closure as other clubs fall by the wayside. Speaking out, Khan said: "Over the last eight years, London has lost 50 per cent of its nightclubs and 40 per cent of its live music venues. This decline must stop if London is to retain its status as a 24-hour city with a world-class nightlife." Whilst a large "Save Fabric" banner was spotted at a recent televised football match between Crystal Palace and Stoke. The very nature of dance music and clubs is that it often skirts on the edge of morality and legality. Youth culture, whether it be punks, rockers, acid house ravers, have enjoyed a high degree of anti-establishment over the years. The act of rebellion, carefreeness and focus on enjoyment are just part of growing up in a post war era. The legendary clubs that have come and gone have all had their controversies. From amphetamined-up white working class kids at northern soul nights to the big goggle-eyed bandana wearers of warehouse raves, clubs dance on the very edges of the law. Whilst this blog isn't the best platform to discuss the rights and wrongs of drug use but we are, like so many fellow dance music lovers, aware of how the music and the drugs go hand in hand. With the case of Fabric and other venues it is incredibly sad to hear of any deaths related to clubs and the dance music scene. It is not the first time someone has died to due illegal drugs, nor will it be the last sadly. Yet the return to the bigger clubs came as a result of clampdowns on raves and an attempt to control the fast growing illegal scene. With that control came more safety for clubbers, but nevertheless there will always be a limit to how much anyone inside or outside a club can control. No club owner wants a death on their premise, and that extends to sporting venues, theatres, bars and theme parks. It is extremely sad but true, but people have always died on nights out for fun, and not always as a result of drugs, sometimes due to alcohol and subsequent violence. For dance music to remain progressive and relevant it has to go through high periods of change. This might be less so in recent times, but that wax and wane also applies to the venues and nights hosted within. Even when something as seismic as the Hacienda closing down, it left Tony Wilson fairly reflective as he was keen to move on away from the feeling of nostalgia. For Wilson, The Hacienda had run its course, to hold on to it was not in the best interest of progression as far as he was concerned. Fac51's long battle with gangs, drugs and police pressure meant that it was just a matter of time before the club folded. The stories were well documented and anyone going to The Hacienda was quite aware of the moody undercurrent that could be found in dark corners on even the most ecstatic of nights. So with other legendary venues such as the Wigan Casino and The End, The Hacienda's time came to say goodbye. Even with highly established, well-loved clubs that can run for many years there comes a time for them to close and their crowd to move on. For Fabric that time seems incredibly premature, a fact that has been backed up by the overwhelming support for the club, in the press and online. Whilst the well documented decline in UK clubs and ever tough legalities for new ones to open, London needs Fabric more than ever. Appeals are just part of the modern world and the social web has made it much easier to try and overturn any decision. Every appeal from Brexit to stopping England Footballer Harry Kane from taking corners have been launched thanks to our democratic and free society by our use of the web to create a unified voice. 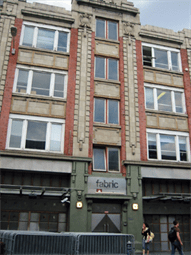 Whether Fabric returns remains in the balance, certainly if the club gets another chance it will be under heavy scrutiny from the local council, police and for a time national media. Regardless of that, the passion and loyalty shown by Fabric supporters, dance music lovers and well wishers can only mean a revived club will be well supported and loved. The worry is that it might be just part of an ongoing attack on UK clubs and their licence holders. The result of that will mean more club closures and potentially a return to unlicensed, unsupervised illegal events. Whilst we all know that these happen, and to a large extent are part and parcel of the UK dance music scene, a wholesale return could take us back to 1994. For now the fight goes on and we at Trackhunter can only offer our best wishes and support for those trying to get Fabric a fair and legal hearing. You can support Fabric's cause by donating here.